Expanding on Outset’s partnership with the Government Art Collection (GAC), we have launched the The TenTen Commission: a ten-year initiative produced by Outset with GAC, and sponsored by leading philanthropists Sybil Robson Orr and Matthew Orr. Every year over the next decade, a British artist will be commissioned by GAC to create a unique, limited edition print which will be shown in diplomatic buildings across the world. A small number will be available for purchase through a collaboration with the pioneering philanthropic arts organisation Outset to raise funds for the GAC acquisition fund. The first commission has been created by Turner Prize shortlisted artist, HURVIN ANDERSON. 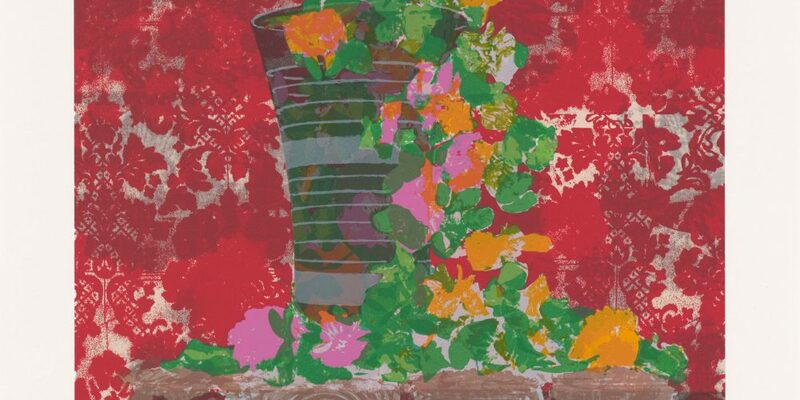 His work Still Life with Artificial Flowers is an intricate print that evokes a snapshot of the artist’s mother’s front room in Birmingham. Hurvin Anderson graduated from Wimbledon School of Art in 1994 and his distinct painting style is informed both by British painters such as Leon Kossoff, Michael Andrews and David Hockney as well as a generation of Black British artists, Sonia Boyce, Eddie Chambers and Keith Piper. The youngest of eight siblings, Anderson was the only child not to be born in Jamaica, instilling an interest in his dual identity that plays throughout his work. As the first TenTen Commission, fifteen prints will be framed and displayed in British embassies and residences worldwide. Hurvin Anderson was born in 1965 in Birmingham, UK. He studied at Wimbledon School of Art and Royal College of Art, London. Selected solo exhibitions include Foreign Body, Michael Werner Gallery, New York, USA (2016); Backdrop, Art Gallery of Ontario, Toronto, Canada (2016); Dub Versions, New Art Exchange, Nottingham, UK (2016); Backdrop, CAM, St Louis, USA (2015); Reporting Back, IKON Gallery, Birmingham, UK (2013); Subtitles, Michael Werner Gallery, New York, USA (2011); and ART NOW: Hurvin Anderson, Tate Britain, London, UK (2009). He has participated in numerous group exhibitions including Making & Unmaking, Camden Art Centre, London, UK (2016); Poetics of Relation, Pérez Art Museum, Miami, USA (2014); Flowers for Summer, Michael Werner Gallery, New York, USA (2011); and Dull as I am, I hope to Live by These Lines, Simon Preston Gallery, New York, USA (2010). He was shortlisted for the 2017 Turner Prize. The Government Art Collection is a national collection established in 1989 and includes works of art from the 16th century to the present day. It promotes British art, culture, history and creativity, and contributes to cultural diplomacy through the display of work in Government buildings around the world as well as in the UK. The GAC also delivers temporary exhibitions and lends regularly to museums for public exhibition. The Outset Artists Flat at South London Gallery is a wonderful example of our vision and endeavours. It demonstrated Outset’s prescient commitment to a gallery with a history of exhibiting artists prior to their soar, whilst offering effectual programming deeply intertwined with the community of Peckham. Employing 6a architects, now a darling of the art world, the development was an elegant solution – both functional and inspirational. We all loved it ourselves! This is supporting new art!